The Delhi High Court has reserved its judgement on the appeal of former senior police officer R K Sharma (Pictured) and three others, who have been convicted to life imprisonment for killing journalist Shivani Bhatnagar more than 10 years ago. After conclusion of arguments from prosecution and defence counsels which were conducted in the High Court on a day-to-day basis, a bench comprising Justices BD Ahmed and Manmohan Singh reserved their judgement. Shivani, a journalist with the Indian Express, was murdered in her Navkunj Apartments flat at IP Extension in East Delhi on January 2, 1999. 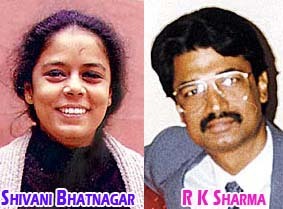 In March 2008, a Sessions court at Karkardooma had held the four accused -- former IPS officer RK Sharma, Sri Bhagwan, Pradeep Sharma and Satya Prakash -- guilty of her murder and sentenced them to life imprisonment in this connection. Sharma's counsel contended that he was falsely implicated in the case as there is lot of lacuna in the prosecution theory. There were several missing links, including the call records, in the chain of circumstances and the records were tampered with to implicate him. Government standing Counsel Pawan Sharma said since the prime accused was posted in the Prime Minister's Office when Shivani met him, any call record, if tampered with, could have been done on his behest. He also contended that Sharma was holding a high position in the police and had influenced the witnesses, as a result of which 43 prosecution witnesses turned hostile in the case. The prosecution also alleged that Sharma had provided certain classified documents to Shivani that led to her murder by the former officer as the journalist wanted to make the documents public.